UC Capitals are two games away from winning their eighth championship. Photo: Supplied by UC Capitals. Why is it, when a female sport’s star or team does well, a comparison is drawn between how that particular star or team would go against male opponents? Over the past 12 months, there have been numerous attempts by people in the media and through the media to make bold claims about how sportswomen would fare against men. A couple of cases in point being comparisons about how Elysse Perry would go against her male counterparts or how Serena Williams would go against Novak Djokovic. The reality is that women’s sport is largely, although not always, a different product to the men’s. Over the past 30 years, I have provided commentary for radio on male and female hockey, men’s and women’s rugby, men’s and women’s cricket, and men’s and women’s basketball. And there is a marked difference. I will make this observation; the women’s game is less defined by brute force and physical dominance but more based on skill. As an aside, I know I am dipping into just a small part of much larger debates about gender and also the influence of sport historically, as established by and for men. I am not belittling these debates and there are obvious linkages, but there are others who do more justice to these more complex discussions. So bear with me and hopefully contribute with a comment. I would argue that we enjoy sport for a range of reasons. I enjoy the physical nature of men’s sport and the skill and finesse of women’s sport. That’s not to say women’s sport doesn’t get physical – just watch a UC Caps’ game and you’ll see physicality – but women’s sport is less reliant on physicality. Throughout history, we can see that sports achievements are defined by a number of different parameters. I would argue that it is these parameters that determine why we enjoy all different forms of sport and why a comparison is the wrong approach. For example, consider historically, stand out performances that show courage, skills, tactics, power, endurance, teamwork, and good ethical behaviour. These achievements are not defined by whether the sportsperson is male or female. And I have seen courage, skills, tactics, power, endurance, teamwork and good ethical behaviour when watching the UC Caps. This is why it is so enjoyable. 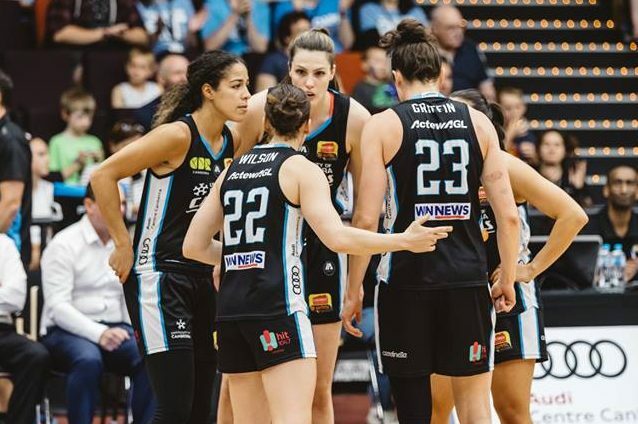 This WNBL season I have secured a greater understanding of the mindset of our leading sportswomen through my role of assisting the UC Capitals with their media commitments. UC Caps team members train as hard as any male sporting team that I have ever seen, often fitting their training around work, children and study. When they are at training they work hard because time is precious and it wouldn’t make sense to waste time training half-heartedly. Kelsey Griffin, for instance, is one of the hardest trainers I have seen in professional sport. She will work and work until she is satisfied the task has been completed. They don’t have the luxury of being able to train full-time with the league, yet they have achieved at the level of full-time athletes. I have often wondered whether the skill level would rise markedly if they did have the opportunity to apply themselves full-time or would it simply mean the players wouldn’t have to juggle work and training? I am now at the point where I would prefer to watch the WNBL than the NBL. I simply enjoy the games and the style of play more than I do the men. The fact that the team I have supported for the past 30 years is in the grand final obviously adds to the attraction. Why aren’t there more women coaching professional sporting teams?